This epic fantasy tale, written by Gregory A. Wilson, follows the story of Icarus and Jellinek, an unlikely pair of heroes who on the surface are about as different as two beings can possibly be. Icarus is a tall, fair-skinned boy of around 17 who falls to the world of Vol from the sky, a graceful being with wings, incredible powers, and no memory of anything but his name. Jellinek is a four-foot hard-scrabble flamepetal prospector with tough red skin, a gruff disposition and general dislike of everyone around him, and a two-tailed lava-resistant creature called a "solar" as a companion. On the day that their lives collide, everything about their world changes, and they discover that they have more in common than they can possibly imagine. Together Icarus and Jellinek will battle the tyranny of the Magisters, who have enslaved an entire people, while unlocking the mystery of Icarus's past. 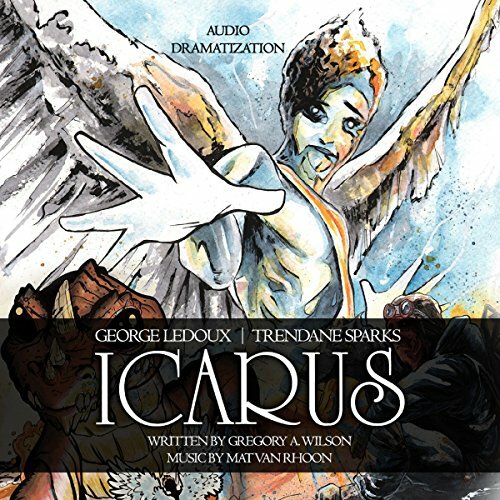 The graphic novel introduces us to the incredibly visual world of Vol and the stunning array of characters and creatures who call it home; this full, unabridged audio dramatization, voiced by professional voice actors George Ledoux and Trendane Sparks with audio postproduction and full soundtrack by Mat Van Rhoon, brings that visual world to aural life.